Wing span: 3 3/8 - 4 7/8 inches (8.6 - 12.4 cm). Identification: Upperside of male is bright orange with wide black borders and black veins; hindwing has a patch of scent scales. Upperside of female is orange-brown with wide black borders and blurred black veins. Both sexes have white spots on borders and apex. Life history: Adults warm up by basking dorsally (with their wings open and toward the sun). Females lay eggs singly under the host leaves; caterpillars eat leaves and flowers. Adults make massive migrations from August-October, flying thousands of miles south to hibernate along the California coast and in central Mexico. A few overwinter along the Gulf coast or south Atlantic coast. Along the way, Monarchs stop to feed on flower nectar and to roost together at night. At the Mexico wintering sites, butterflies roost in trees and form huge aggregations that may have millions of individuals. During the winter the butterflies may take moisture and flower nectar during warm days. Most have mated before they leave for the north in the spring, and females lay eggs along the way. Residents of tropical areas do not migrate but appear to make altitude changes during the dry season. Flight: In North America during spring and summer there may be 1-3 broods in the north and 4-6 broods in the south. May breed all year in Florida, South Texas, and southeastern California. Caterpillar hosts: Milkweeds including common milkweed (Asclepius syriaca), swamp milkweed (A. incarnata), and showy milkweed (A. speciosa); and milkweed vine in the tropics. Most milkweeds contain cardiac glycosides which are stored in the bodies of both the caterpillar and adult. These poisons are distasteful and emetic to birds and other vertebrate predators. 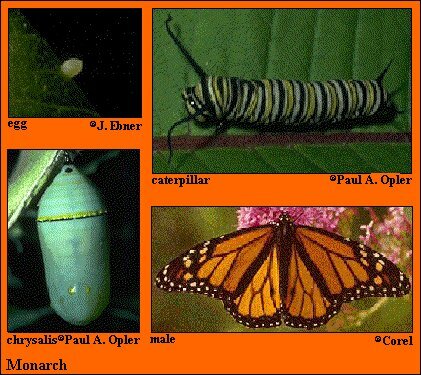 After tasting a Monarch, a predator might associate the bright warning colors of the adult or caterpillar with an unpleasant meal, and avoid Monarchs in the future. Adult food: Nectar from all milkweeds. Early in the season before milkweeds bloom, Monarchs visit a variety of flowers including dogbane, lilac, red clover, lantana, and thistles. In the fall adults visit composites including goldenrods, blazing stars, ironweed, and tickseed sunflower. Habitat: Many open habitats including fields, meadows, weedy areas, marshes, and roadsides. Range: Southern Canada south through all of the United States, Central America, and most of South America. Also present in Australia, Hawaii, and other Pacific Islands. Comments: The Viceroy butterfly (Limenitis archippus) is edible, but mimics the poisonous Monarch in order to gain protection from predators. Conservation: Overwintering sites in California and Mexico should be protected and conserved. Management needs: Develop conservation and management plans for all wintering sites, migration corridors, and principal breeding areas. World Conservation Union, Gland Switzerland.